St. Francois County Community Partnership's mission is to build, nurture, and strengthen families, insuring that every person has the opportunity to become a healthy, productive, and contributing member of the community. The Family Health Expo is a FREE annual event that has been coordinated by the Partnership for many years. The expo provides health screenings and educational materials to the general public. Children enjoy fun activities and carnival games as well as demonstrations on safety. The expo is supported by local businesses, organizations, and agencies. The Family Health Expo provides many medical testing opportunities such as mammograms, blood sugar, cholesterol, and vision screenings; and has more than 50 exhibits with information on accessing local resources to support family health and mental health. 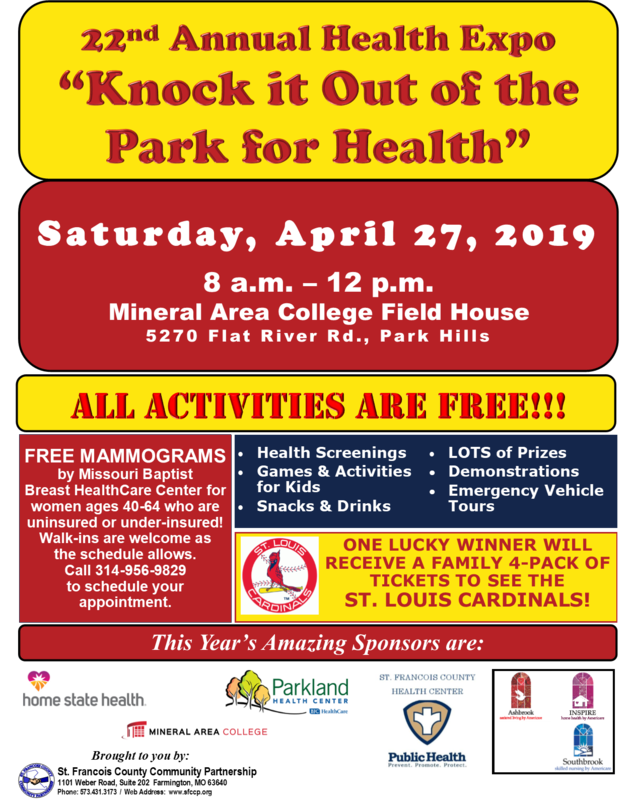 Our 22nd Annual Health Expo is scheduled for April 27, 2019 at Mineral Area College Field House from 8:00 a.m. to 12:00 p.m.
CLICK HERE for an Exhibitor Packet if you'd like to be a part of this year's expo. Click here for the complete flyer for this year's Expo including vendors. SFCCP adds value and brings hope to children and families in our communities through advocacy, awareness events, and by helping individuals locate appropriate resources. We work with our local state agencies, schools, and community organizations to best meet the needs of children and families. Tune in to hear more about programs of St. Francois County Community Partnership on KREI with Mark Toti the 3rd Thursday of each month 9:30 a.m. and on KFMO the 4th Monday of the month at 7:35 a.m. The SFCCP Board of Directors meets the second Wednesday of each month at noon at the St. Francois County Weber Road Facility in the training room at 1101 Weber Rd, Farmington. All SFCCP meetings are open to the public. We welcome you to attend! The Board of Directors does not meet in December.